Unless you happen to be a (huge) Harry Potter fan. Because if you are, then you know that eleven is the age at which witches and wizards receive their owls inviting them to attend Hogwarts School of Witchcraft and Wizardry. Eleven is the age at which everything changes, where the chosen ones are weeded out from the muggles, where new horizons are tantalizingly around the corner. As I’ve said before, one of the most marvelous and astonishing things about sharing the Harry Potter series with Ella (and now Annie) has been that they see the story from Harry, Ron, and Hermione’s perspective. By the time I met Harry, Ron, and Hermione, I was already an adult myself. It was fascinating to watch them grow, but I did so with an emotional distance – they were kids, and although I was extremely drawn in by the power of [the] storytelling, I never once imagined what it was like to BE eleven. Ella, on the other hand, is viewing the stories through the eyes of a child, almost as a peer. She doesn’t just envision the Gryffindor common room (as I did); she envisions herself IN the Gryffindor common room. And so I suppose it should come as no surprise that, as she approached her eleventh birthday, Ella hoped she would receive an owl. She never told me so explicitly – she realizes that the books are fiction, obviously – but it was clear that, somewhere in the back of her mind, she was entertaining the possibility that maybe somehow, in some parallel universe we have yet to tell her about, there really is a Hogwarts and she really is a witch, and, well… Wouldn’t that be amazing? It would. It would be amazing. And I have no doubt that, should such a place exist, Ella would be qualified for admission (if only due to sheer adoration and willpower). 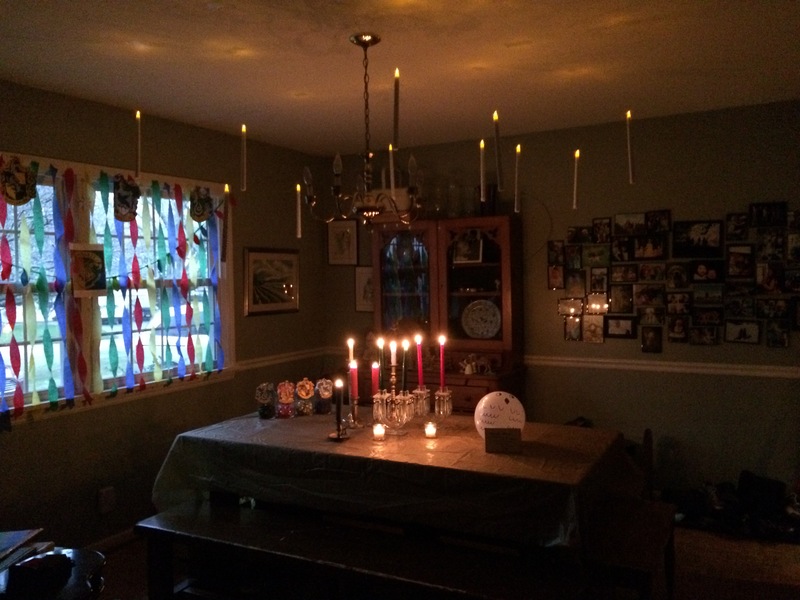 So, the dining room became the Great Hall – kinda. 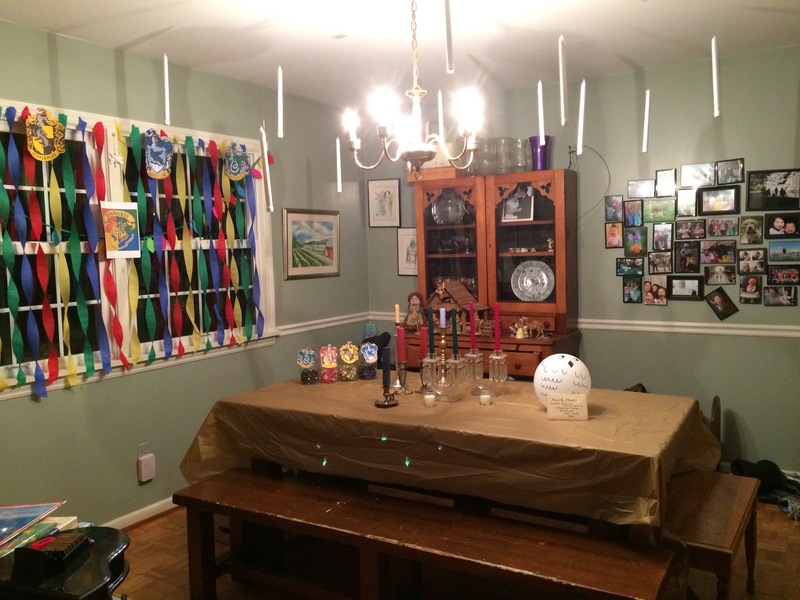 Hogwarts house banners and colors, “floating” candles, and a balloon owl (it was the best I could do) — but with an actual letter from a super cool Etsy shop. It looked pretty neat all lit up. A bunch of gifts, from all different family members, were Harry-themed. Ella loved each and every one. 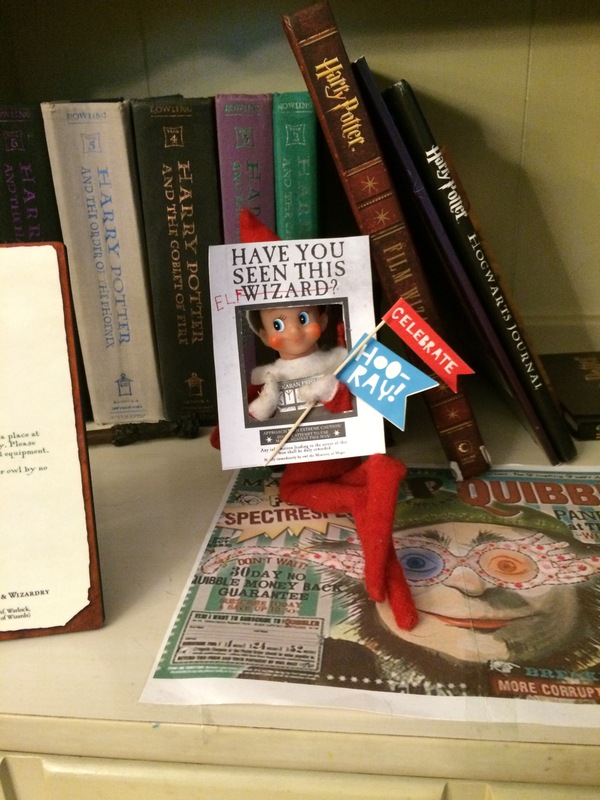 Even our Elf on the Shelf, Hermey, got into the action. He was waiting for her – amongst her HP collection – in her bedroom that morning. Naturally, not every part of Ella’s birthday was about Harry. Annie contributed several additions that, really, were more than a little awesome. 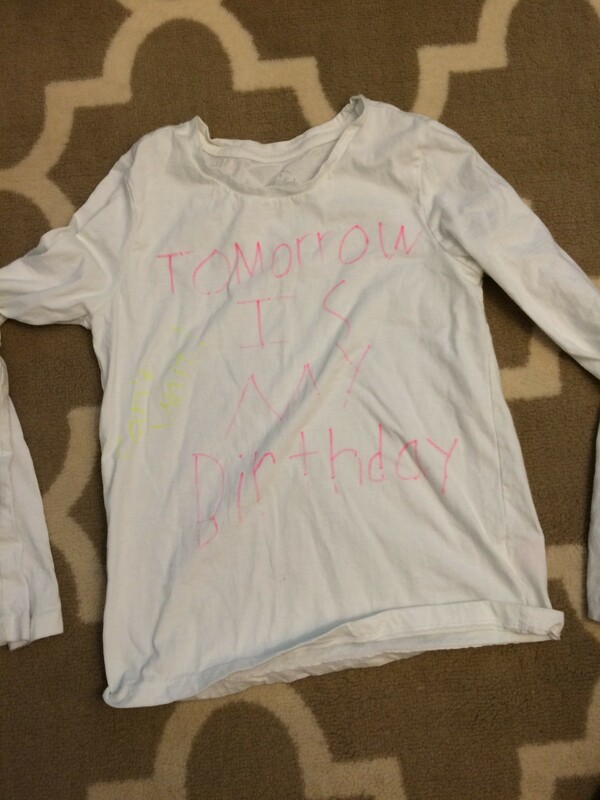 First up was a set of three shirts, one for each of the days surrounding Ella’s birthday. 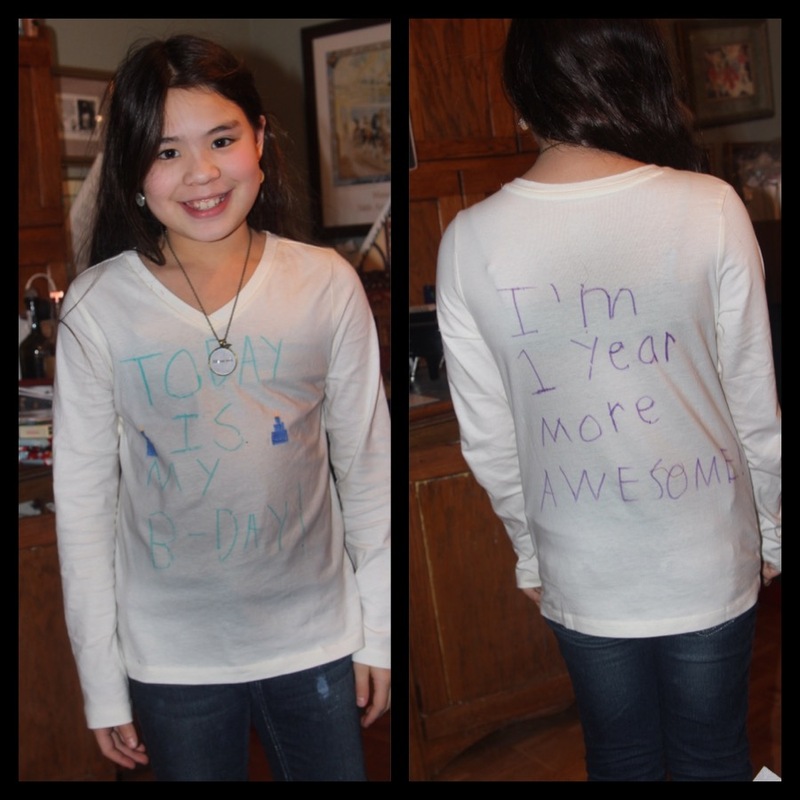 and, “I’m 1 year more AWESOME!” on the back. 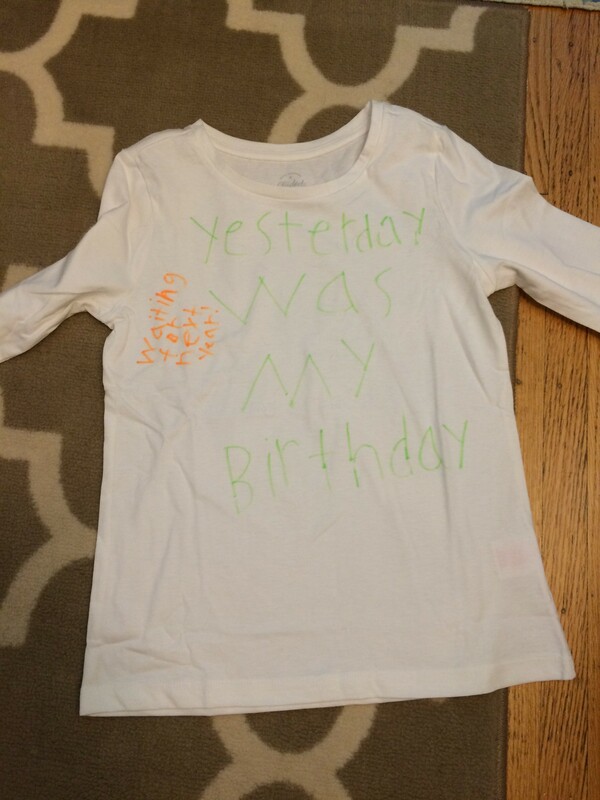 “Yesterday was my birthday” with – my favorite – “Waiting for next year!” in orange on the side. HA. 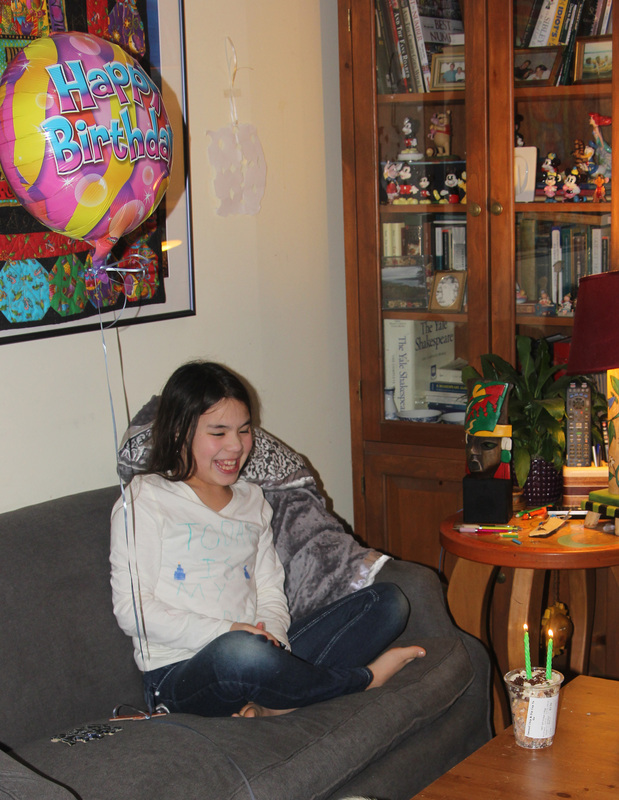 Unfortunately, Ella’s birthday fell on a weekday so she couldn’t choose how to spend her day. She did, however, revel in her Great Hall, open presents in the afternoon, wander the mall with Nick (her birthday request; so help me, she is already pining to WANDER THE MALL), eat a dinner of her choosing (loaded baked potatoes and wedge salads), and for dessert – knowing she’s not particularly fond of cake – we surprised her with one of her favorites: cannolis. Or, more specifically, cannoli “dippers” from Wegmans — a cup with cannoli pastry chips at the bottom and a container of filling at the top. Ella was in heaven (as always, Wegmans is my spirit animal and saved the day). When the night was nearly at an end, Nick and I called the girls into the living room to give them their final, joint birthday present. In a recent conversation with both girls, they told us that, of all the people in the world, the one they’d most want to meet was J.K. Rowling – they so admire her, they think she’s amazing, there’s no one cooler – but if they couldn’t meet her, at least they’d like her autograph. Nick and I told them such things are impossible; authors don’t do that. So, yes, we lied to the children. Point blank. Then I scoured the internet researching such a possibility. 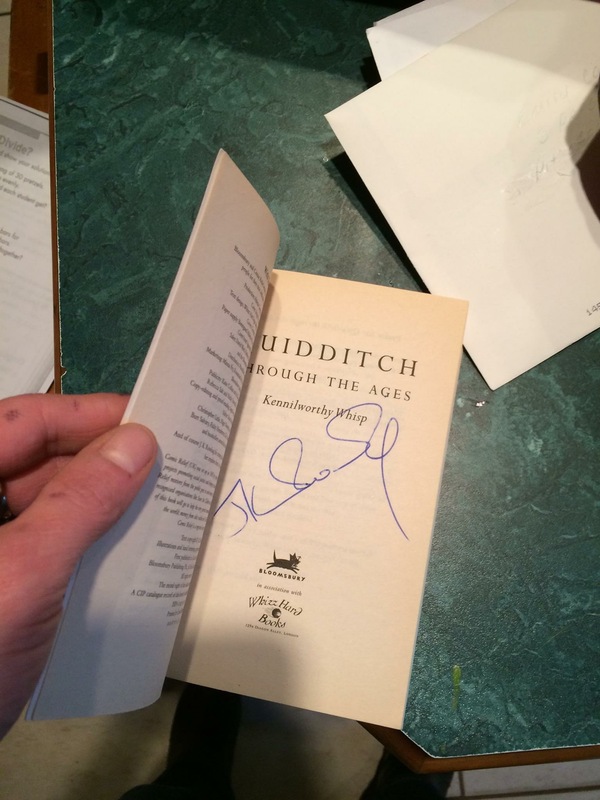 After learning far more than I ever wanted to know about autograph authenticating, reputable dealers, pricing, etc., I happened upon an Ebay auction of a signed copy of Quidditch Through The Ages. Long story short, the stars aligned and a few days later, I was – literally – chasing after our mail carrier to pick up the book. I cried when I opened it. It was, in the vernacular of the Brits, brilliant. Although we may be muggles, this book feels positively magical. So does having our E-Bean for a daughter. She is a tween for sure – with everything that you would imagine comes along with such a moniker – and we are just smitten with her. As she grows older, she grows more into and sure of herself, more empathetic, more sensitive, more intuitive and insightful, wittier, kinder, bolder, and oh so much fun. She is positively slaying the French Horn and remains a joy to watch come alive in the pool. In short, she is incredible. 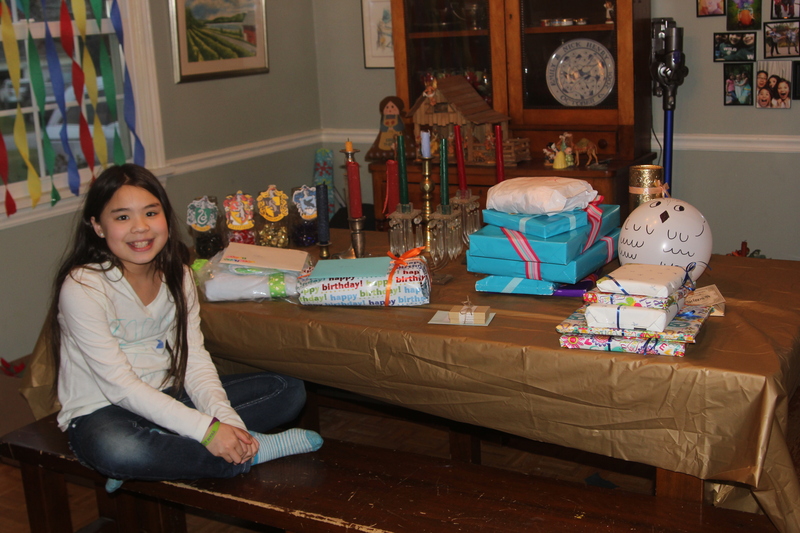 Happiest eleventh birthday, Eleanor Elizabeth. Although your owl may have been poppable and your Great Hall “floating” candles may have been suspended by fishing wire, our love for your is oh so real. You are magic to us and we will stay with you – to quote Harry’s mom, Lily, Until the very end. 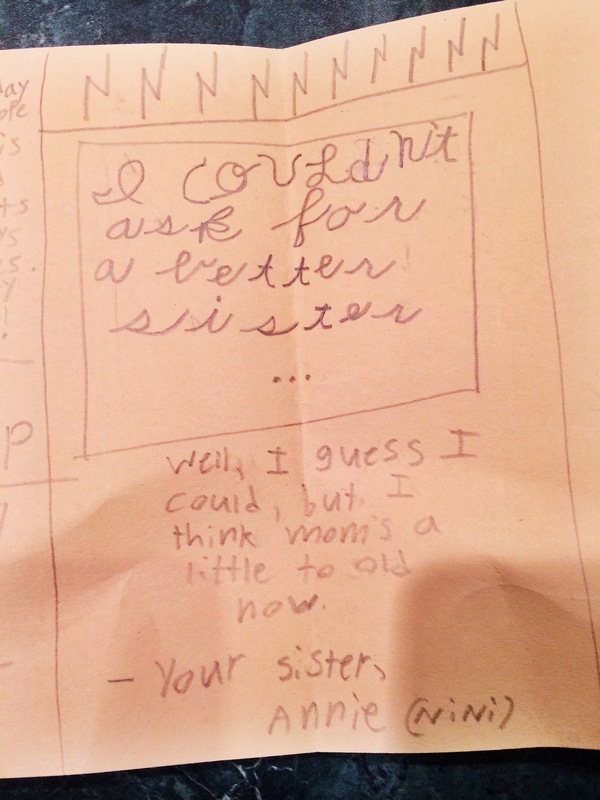 This entry was posted in good life, thinking and talking, typical crazy and tagged birthdays, Ella, Harry Potter, magic, parenthood by missemtoo. Bookmark the permalink.